UPDATE: Enjoy this project from our former home. We’re giving our new home a complete remodel. Click HERE to take a look! 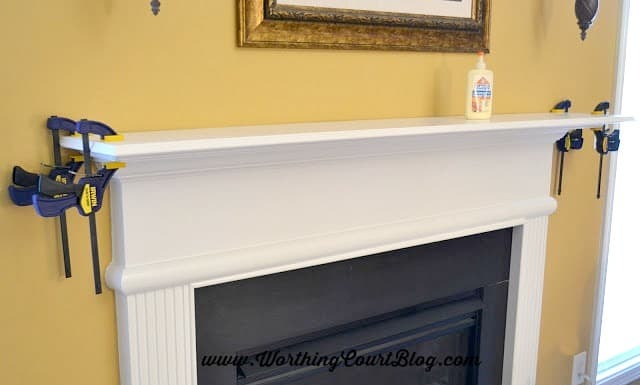 When it comes to fireplaces and mantels, I have several pet peeves. One of them being the shallowness of prefab mantels. 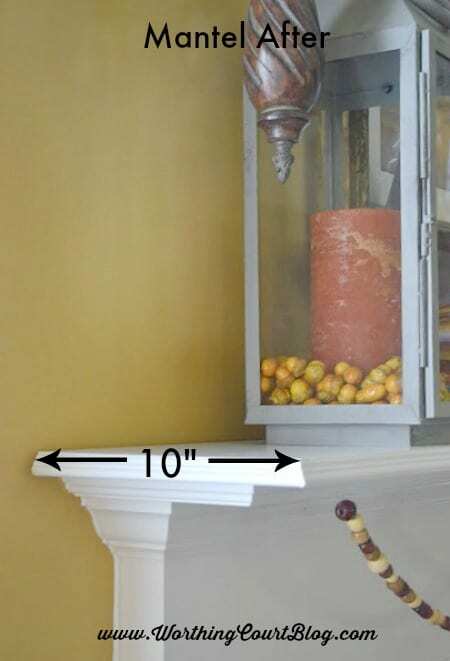 The mantel above my fireplace has a mere 7″ of space from front to back. Ack! I can’t do anything with that! Especially since the thickness of the picture frame hanging above it takes up part of that 7″. It limits everything that I ever want to put on my mantel. Very frustrating. So I came up with an easy solution that Pookie did for me. 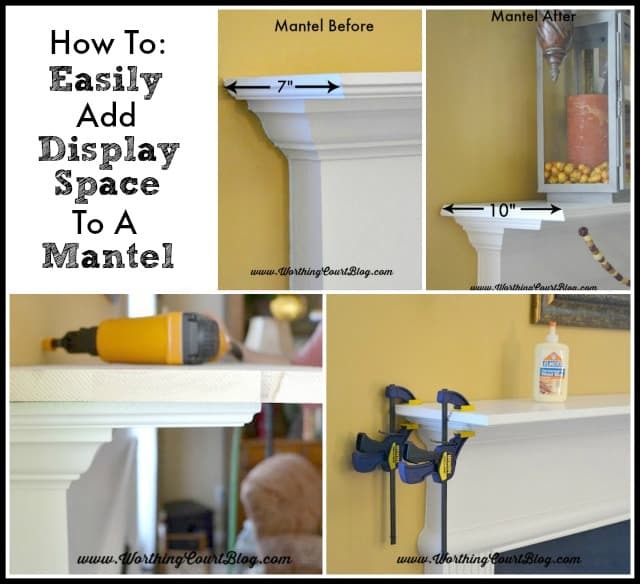 I wanted to extend the amount of space on my mantel by 3″, meaning that I wanted to have 10″ from the front to back of the it. I simply purchased an 1″ x 12″ x 8′ piece of birch wood from Lowes and had them cut it to the size that I needed. In my case, I needed it cut to 1″ x 10″ x 6.5′. BTW – I chose birch instead of pine so that I would have a flawless surface once it was painted. To avoid having to use a router to get a decorative edge, I found some trim that closely resembles the edge of our existing mantle. Here you can see the profile of the trim that has been applied just to the front of the board using carpenter’s glue and a nail gun (to hold the trim in place until the glue dried). And here is the same end with the decorative trim applied to the side. The trim doesn’t match perfectly, but I knew that no one would notice (unless it was a trim inspection person) once it was all painted. 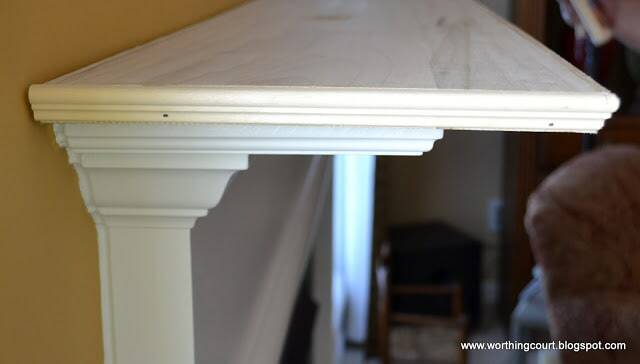 After filling all of the gaps and nail holes and applying paint, the board was attached to the existing mantel using carpenter’s glue and a few nails to help hold it in place until the glue dried. I know that carpenter’s glue dries pretty quickly, but just to be on the safe side, I left the clamps on for twenty-four hours. 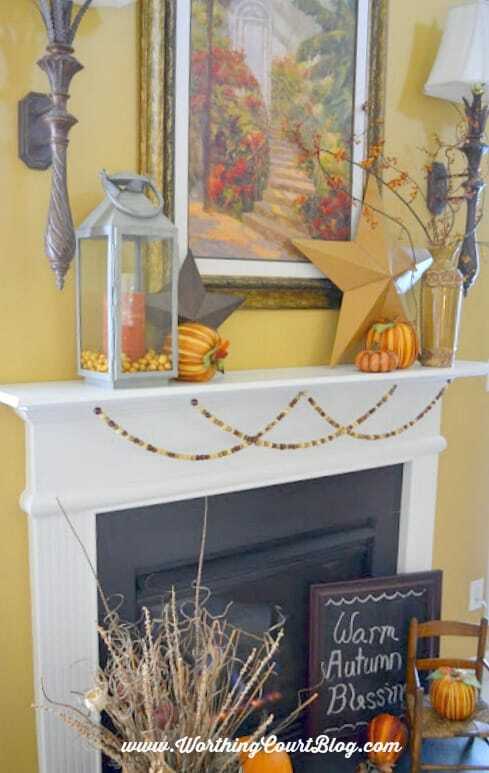 Trust me – decorating my mantel for Fall was much more pleasurable this year! A fireplace that is out of proportion to the size of the room (like mine). I have a two story family room – the fireplace should be taller! No hearth to sit on. I guess it’s just cheaper and easier to slap a piece of slate flat on the floor than to build a hearth. You and Pookie did a fantastic job! I love layering things and the 7 inches does make that difficult. Great idea! And you made it look pretty easy for those of us who are not great at woodworking. Great idea and it turned out very nice! 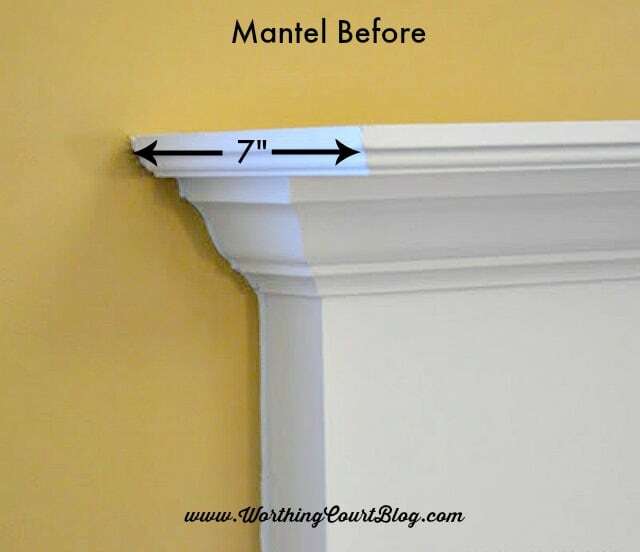 I know our mantel is made with a series of moldings and trim to achieve the look we got. I think a lot if carpenters are just not skilled enough to do the work so they opt for the easy way out. You definitely improved yours and now you can enjoy decorating it! What a great tip! It looks like it has always been that way. We had to do that to our mantle, in order to accommodate the tv. It is definitely one of the easiest fixes. Why, yes, you should! I LOVE what you did, Suzy. It is a genius idea, and isn’t it fun to have extra depth for all of your gorgeous decorating goodies, especially during the holiday season! Suzy, this was such a clever idea! I think you may be in for a new line of work!! LOL!!! Fireplace design! That is a great idea.Your mantle looks so pretty. I have the same problem and now I know how to fix it! But that also means I might have to clean up my living room to get to the fireplace! hehehe! 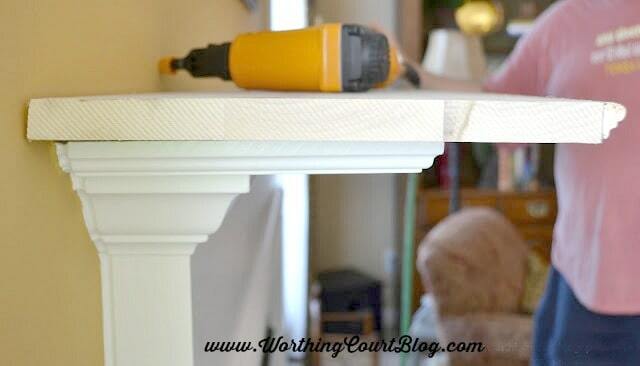 Suzy, I have the same problem with our mantel and it drives me crazy trying to decorate it. Thanks for sharing this solution at my party. What a great idea! I have something semi hanging off my mantle right now! Thanks! Great idea and it looks great. My mantel is actually 10 inches but I would still love more room. I also agree about the hearth. My fireplace is in the dining room so it would also add extra seating. I pictured my mantle today at http://www.asouthernlife.com if you would like to take a look. Yours is lovely! I’m soooo glad that you posted this! I’ve been telling hubby that this is what i want to do to our FP. He kept telling me it wouldn’t look right. I think my mantle is only 5 1/2 inches deep. Its very hard to accesorize. As for the hearth … we have a brick hearth that is about 3 bricks high. I wish we had the slate slab like you have. My room isn’t as big and the FP really makes a bit more of a statement than i’d like. If that hearth didn’t stick out like it does I could snuccle a couple chairs closer to the FP. I think it really about the design esthetics of the room. What a wonderful idea. My mantel is also narrow. In my old house we had a more rustic fireplace, and the mantel was about four inches thick, and probably 9 inches wide. I decorated it back then, but not like we do these days. I could have a hey-day with it now! Your project turned out really great! Thanks for sharing the tutorial with us! 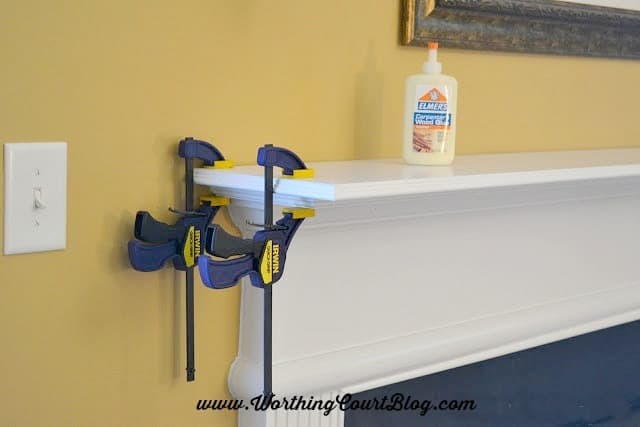 This is a great idea–your mantel is lovely! I know what you mean–sometimes you feel you have to “go to the factory” and start over from scratch with a project or area in the home! what a simple way to add more space! love it! Perfecto solution Suzy! Great job. I love your Fall decor as well. Thanks so much for sharing with the party. You have just answered a fervent prayer! Thank you! These simple solutions are the best and this really help give your fireplace that added substantial look. Thanks for sharing this on BeColorful this week. Just wanted to thank you for putting this diy up. Never would have occurred to me to do this, but it really saved the day! I needed to extend for a large flat screen that I didn’t want to wall mount and it worked perfectly!